When you hear the name Maria Martinez, one automatically envisions the wonderful black on black pottery for which she and her husband Julian became famous. For the serious Maria collector however, the rarest and most desirable of all Maria’s work is her polychrome pots. The term polychrome refers to a multicolor painted pot. 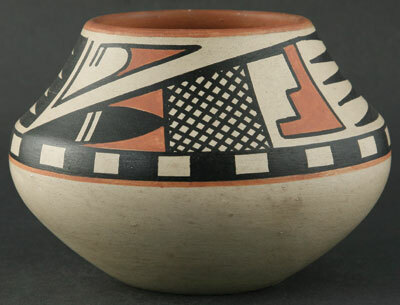 Maria and Julian’s polychrome pottery generally used a cream slip background with design elements painted in black and red-orange. Occasionally, a red background with black and white designs was also done. These rare polychrome jewels come in a variety of styles, both signed and unsigned. Pair of Maria Martinez Polychrome Pots, circa 1915-20, 3.5" x 6"
The origins of San Ildefonso polychrome ware probably started around 1875 with known examples occurring by the early 1880s. 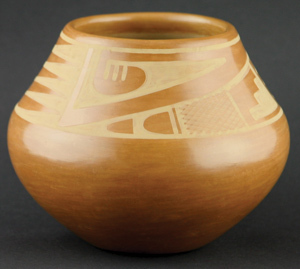 The first pieces were done with a laborious stone polishing technique that changed around the turn of the century when the native San Ildefonso slip was replaced with an easier cream color slip used by their Cochiti pueblo neighbors. The new slip could be polished using a rag instead of a stone. This made production faster. Slip is used by collectors today to determine the age of polychrome pots. The rag slip has fine parallel lines and more of a matte finish. Stone polishing is somewhat shinier and has very fine crackalure, which can be seen under find examination radiating throughout the pot. Another marker used to date these polychrome pots is the color of the rim, which was generally red until 1910 then changed to black. Maria, who is known for the exquisite polishing and shaping of her pots, worked with not only Julian but also Maximiliana (Anna), Alfredo Montoya and Crescencio Martinez in the painting of her early polychrome pottery. Documented examples of Maria herself painting are extremely rare. Maria and Popovi Sienna Geometric Jar, February 1963, 5" x 6"
Collectors looking for early Maria polychrome pottery can find two types of pieces: signed or unsigned. The unsigned seem to be more common than signed. Signed pieces either bear the signature of “Marie” or “Marie and Julian.” The signature should be in the slip and, in general, is found on the bottom of the pot. Occasionally, you will see a piece signed on the inside of the pot or even on the side, but these are extremely rare. Also seen, but not common, are early unsigned polychrome pots taken back to Maria to authenticate. These will be signed in pencil “Maria Poveka.” If an unsigned pot is attributed to Maria, it should have an accompanying letter of authenticity by one of the experts in Maria pottery. 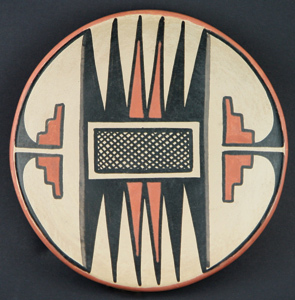 Maria and Popovi Polychrome Plate, circa 1956-58, 5.75"
Many types of polychrome pottery were done by Maria including: corn meal bowls, effigies, canteens, plates, plaques, low bowls, jars, and even large ollas. The polychrome plates are some of the most artistic pieces; the surface became a canvas on which Julian expressed his exceptional skill as a painter. These include large feather designs, abstract birds, and realistic eagle dancers. Shortly sometime after 1925, Marie and Julian transitioned to the production of black pottery. Their 1919 discovery of how to make black on black pottery would become not only their trademark but also the reason for which Maria and Julian would become known worldwide. 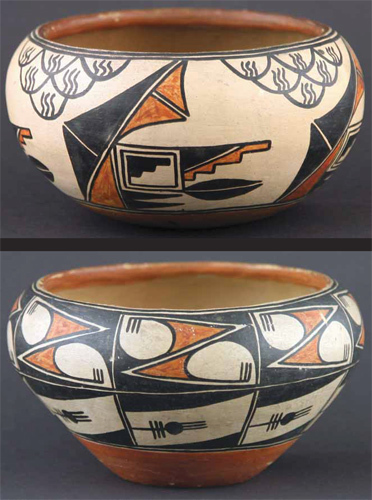 Their black pottery tradition is continued today by many other pueblo pottery masters of the Rio Grande pueblos. For the avid Maria Martinez collector however, their collection is not complete until they have the earliest of Maries’, a polychrome masterpiece. Collectors can view over 70 pieces by Maria Martinez and family at the 11th annual Show & Sale at Mark Sublette Medicine Man Gallery and Santa Fe that opens August 14 and runs through September 11. The entire Maria Martinez collection can be viewed online at www.mariapottery.com.